The Chennai Super Kings led by one of the finest captains Indian ever produced — Mahendra Singh Dhoni will face a rejuvenated Royal Challengers Bangalore (RCB) after 2 years. The South Indian Derby will surely be a much-anticipated contest where both CSK and RCB are boosted with their recent triumphs. While CSK edge past SRH in a thrilling nail bitter in Hyderabad, Bangalore on the other thrashed Delhi Daredevils thanks to AB de Villiers who tormented the Delhi bowlers in his masterclass on matchday 21. 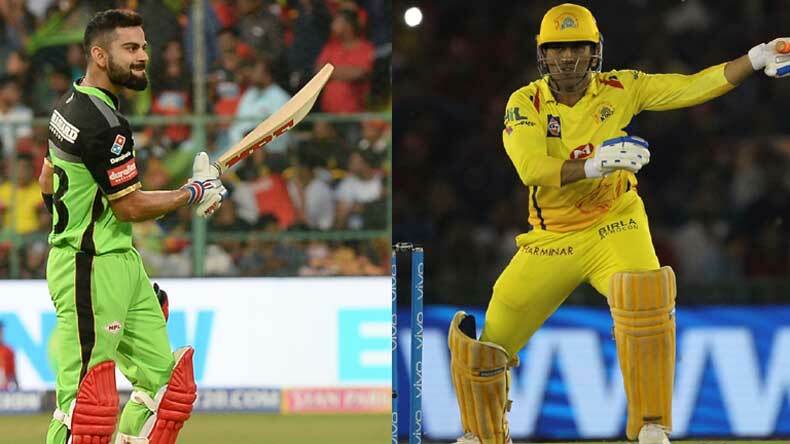 It’s the battle of the giants in the 11th edition of the Indian Premier League on Wednesday as Royal Challengers Bangalore and Chennai Super Kings will finally get a chance to reignite one of the oldest rivalries at the M Chinnaswamy Stadium. The Chennai Super Kings led by one of the finest captains Indian ever produced — Mahendra Singh Dhoni will face a rejuvenated Royal Challengers Bangalore (RCB) after 2 years. The South Indian Derby will surely be a much-anticipated contest where both CSK and RCB are boosted with their recent triumphs. While CSK edge past SRH in a thrilling nail bitter in Hyderabad, Bangalore on the other thrashed Delhi Daredevils thanks to AB de Villiers who tormented the Delhi bowlers in his masterclass on matchday 21. Anderson to bowl the last over: FOUR! Unlucky, Boundary for CSK. SIX! WHAT A HIT! Bravo clears the boundary with the maximum. This match has recorded the highest number of sixes—32 so far. Sliced it hard will get a single now. 5 more runs required in 3 balls. MS Dhoni is on strike. SIX! What a way to end the match. WOW! Absolute stunning performance by the CSK skipper. RCB bowlers have gone for plenty tonight. MS Dhoni signs of in style with a maximum. We have been privileged to witness another masterclass from Captain Cool—MS Dhoni. Chennai Super Kings were once 74-4 they were struggling big time. Then came MS Dhoni who became the back-bone of the Chennai outfit and paired up with Ambati Rayudu for a rock solid partnership. Anderson replaced by Siraj: Dot on the first ball. Single taken by Bravo as Dhoni gets on strike. Dhoni sliced it hard but will get a single. Full toss, Bravo swings it hard but will get a single. Dhoni goes old school! Smashes Anderson for a SIX. That was pure power by the CSK SKIPPER! 9 runs from it so far. WIDE! Pressure gets Siraj in the end. Wide again! Siraj need to regroup himself, he cannot leak extras like this. The reputation of MS Dhoni clearing long on effortlessly is getting into Siraj’s mind. Another WIDE! Thats a hattrick of wide from Siraj. Kohli is absolutely livid with Siraj. Single on the last ball as Dhoni keeps the strike. Anderson replaces Siraj: Single taken on the first ball. WIDE! Anderson will bowl that again. SIX! 50 for MS DHONI. The CSK captain has struck 5 6s in this knock. He smashes the next ball to take a single. FOUR! Rayudu gets into the act, smashes a boundary on the 4th ball. Good yorker and chance of a run out. OUT! Direct hit and Rayudu has to go! He’s mercurial knock of 82 that came in just 53 deliveries got RCB on the back foot. Rayudu departs and next man is Dwayne Bravo. Takes a single to keep the strike, end of the over CSK are no 176-5 in 18 overs. Anderson replaced by Siraj: Single taken by Dhoni on the first ball to give danger man Rayudu the strike. Good yorker by Siraj, just a single. Dhoni smashes it hard, good attempt by the fielder to keep it safe. Dhoni cuts this one after taking 2 on previous ball, will get a single this time. End of the CSK are 161-4 in 17 overs. Anderson gets back into the attack: Dhoni smashes Anderson straight down the ground but will get a single in the end. Swing and a miss by Anderson, no run taken. Up in the air and DROPPED! That will cost RCB for sure. Anderson has been smashed for a SIX after a wide now. Goes again and connects it well, its raining sixes at the Chinnaswamy Stadium. Rayudu punishes RCB defence after bein dropped earlier in this over. CSK now need 55 in 24 balls. End of the over CSK are now 151-4 in 16 overs. Kohli introduces Siraj: 8 runs including a mammoth six by Rayudu as he ends Siraj’s over.CSK now need 71 runs in 30 balls. Negi replaces Anderson: Back to back sixes from Dhoni and Rayudu as Chahal faces the music. CSK are on the brink of comeback. CSK are 126-4 in 13 overs. Chahal replaces Anderson: Single taken on the first ball by Dhoni. Down the track goes Rayudu and takes a single. Dhoni does the same. Dot ball, Rayudu was expecting a WIDE. This time it is.. WIDE signaled by the umpire. Kohli introduces Cory Anderson: Single taken on the first ball by Rayudu. The review goes in vain for RCB as 3rd asks Rayudu to continue playing. WOW! Dhoni clears the second tear and gets a maximum. End of the over CSK are 101-4 in 12 overs. Chahal replaces Negi: Chahal starts his spell with a single. Dhoni smashes the next ball and takes a quick double. Dhoni then pushes hard for 2 and gets it quite superbly, good support shown by Rayudu. Good delivery by Chahal as he forces Dhoni to defense it.Takes a single to give the strike to Rayudu. So far so good for RCB. NO BALL! This might ruin things for RCB. Chahal was going so well so far. Dot ball as Rayudu fails to connect. End of the over, CSK are 90-4 in 11 overs. Chahal replaced by Negi: Next man is MS Dhoni, and he is off the mark in style! SIX! a massive hit by CSK skipper. Dhoni plays the 6 balls of Negi to end the over. The visitors now 123 runs in 60 balls. Umesh Yadav replaced by Chahal: Dot ball by Chahal. Another one as he continues to pressurize the batsman. Inside out goes Rayudu and he has hit that emphatically well, SIX to him. Good come back by Chahal as he gets back with a dot ball. WIDE! Too much turn as Chahal has to re-ball this one. Cleaned him up! Jadeja beaten all ends up! Tried to play this one on spin, not today Jadeja as he departs on 3. Strategic timeout awaits for both dugout as CSK are now slipping away from this tie. CSK are 74-4 in 9 overs. Umesh Yadav replaces Chahal: Umesh Yadav starts with a dot ball. Jadeja smashes Yadav after coming down the track; he gets a single for this as Rayudu gets back on strike. Single taken by Rayudu as Jadeja has been put back on strike. Flicked away on the leg side for a single. Just 5 runs from this over, good spell for Umesh Yadav. End of the over CSK are now 66-3 in 8 overs. Umesh Yadav replaced by Chahal: Billings uses Chahal’s pace to get the better of him, FOUR! to him. OUT! Class bowling by Chahal as he Billings misses this one. Chahal removes Sam Billings, De Kock knocks the bails in no time to confirm his departure. Ravindra Jadeja is the next man in for CSK. back to back for Chahal as he looks keen to put CSK on the back foot. Excellent over from Chahal as he gets a wicket in this one. CSK are now 61-3 in 7 overs. Umesh Yadav replaces Mohd Siraj: Leading edge and taken! Raina departs as Umesh Yadav strikes for RCB. Next man is Sam Billings for CSK. Strong appeal but denied by the umpire. Smart decision by RCB as they refuse to take a review. Flicked away on the leg side by Sam Billings, the outfield was lightning quick as he gets his first boundary. Very wristy Billings flick the ball superbly. WOW! A peach of a delivery by Umesh Yadav. Dot ball in the end as Yadav ends his spell. CSK are now 55-2 in 6 overs. Umesh Yadav replaced by Mohd Siraj: Starts with a dot ball. Rayudu smashes this one as well! 4 RUNS to him. Good delivery as the ball came back in, single taken by Rayudu. Wide from Siraj as he leaks his first extra. Down the track comes Raina and smashes Siraj as he stepped away to free his arms to get 4 more. Raina has gone past Kohli to become the all-time top scorer in IPL. Takes a single to give Rayudu strike. Smacked hard! Raydu continues his free-scoring flow as smashes Siraj straight down the ground. Partnerhsip is now 42 in 25 balls between Radyud and Raina. After 5 overs,. CSK are 50-1 in 5 overs. Umesh Yadav replaces W Sundar: Rayudu is one FIRE! Just a flick of the wrist and it has gone for 6!. Short and wide by Umesh Yadav, he gets away with this one. Good comeback again by Umesh Yadav. He has an economy rate of 4.9 in powerplay. Single taken by Rayudu as he gives strike to Suresh Raina. Raina drives it fine, and gets a welcome boundary. Virat Kohli is plucking! Yadav manages to put the pre-meditated short ball behind the boundary. Dot ball in the end as CSK reach 35-1 in 4 overs. Umesh Yadav replaced by W Sundar: Another spinner brought in by Kohli as he introduces W Sundar. Strong bottom hand by Rayudu, no run taken. Down comes Raydu and ball disappears as he smashes Sundar for a SIX! Rayudu goes again! SIX more for Ambati Rayudu. Sheer timing by the batsman, its raining 6s for CSK. Dot ball in the end by Sundar. Flicks away fine for single to retain strike, 14 from the over—CSK are now 24-1 in 3 overs. Umesh Yadav replaces Negi: After 2 dot balls, Rayudu takes a single to give Raina the strike. Straight at the fielder as Raina drives his first. His average is 19 against RCB in IPL. Good delivery by Umesh! There’s a buzz around the ground after that peach of a delivery. Single taken by Raina as he retains the strike. End of the over, CSK are now 10-1 after 2 overs. Negi to Watson: Watson takes the aerial route and smashes Negi for a SIX! First boundary for CSK. OUT! Watson departs as Negi gets his man cheaply. 1ST over gone, CSK are 7-1. Smart captaincy by Kohli. Bravo bowls the last over: OUT! Dhoni spot on. Brilliant run out by Captain Cool. A dot ball in the end what a start to the last over for CSK. New batsman is Washington Sundar. Full toss smashes and a mixup! What drama here! RUN OUT! Negi has to go. Wide by Bravo! High and mistimed again by the batsman. OUT! Umesh Yadav departs. SIX! Washington Sundar gets into the act as he smashes this one. 2 balls to go and RCB are now 199-8. Down the ground goes Sundar gets 3 to bring the 200 run mark for RCB. Scintillating batting by RCB so far. FOUR! Great cameo played by Siraj in the end he smahes one fo 4. RCB finish on 205 -8 in 20 overs. CSK need 206 runs to win this one. Thakur brought back by Dhoni: SIX on the first ball by Mandeep. Single taken on the next ball. Single again as De Grandhomee gets back on strike. Wide! Dhone nodge his head. Mandeep goes deep and gets the maximum! Talk about timing, knuckleball was smashed for an 84m six. WIDE AGAIN! Frustration at peak for CSK. HIGH AND TAKEN! Jadeja takes it! Mandeep departs but what brilliant innings by Mandeep. End of the over, RCB are now 191-5 in 19 overs. Bravo replaces Tahir: Single taken on the first ball. Dot on the second as Dwayne banks on his stellar run. Good bowling by the death over specialist. Swung and a miss by Mandeep again. Dropped! Dwayne drops it!Difficult one in the end, ball was struck really hard by Mandeep. Slow full toss whipped away by de Grandhomme. Deepak Chahar is the man on the deep, sloppy throw in the end. Strong shot by Grandhomme as he gets a welcome boundary. No margin for error on this pitch. Good boundary by Grandhomme. RC are now 173-4 in 18 overs. Tahir replaces Jadeja: Three back to back singles taken in Tahir’s over. He has just bowled 1 expensive over. Risky business by both of the batsman as theys seal a quick double. End of the over just 7 from it. RCB are now 164-4 in 17 overs. Bravo replaced by Tahir: After 5 dot balls, Tahir has got the important breakthrough for CSK! Ab departs for 68. Out! Corey Anderson departs for 2 as Tahir gets 2 in this over! Bravo replaces Thakur: OUT! De Kock departs as Bravo gets the breakthrough. De Kock departs for well made 53. Next man is Corey Anderson. 5 dots and a wicket—this has been the story for Dwayne Bravo over so far. Brilliant comeback by CSK as Bravo gets a well -deserved maiden. End of the over, RCB are now 138-2 in 14 overs. Watson replaced by Thakur: In comes Shardul…there goes Shardul! 50 for De Villiers as he continues to electrify the Chinnaswamy Stadium. He is not done yet! 2 deliveries close to 146kmh have witnessed similar result! Smashed for SIX! Another One! Can anyone stop this guy? De Villiers smashes again as he gets up and over! hattrick of sixes for AB. AB is toying with CSK. Good delivery by Shardul as AB takes a single. Perfect execution of a yorker by Thakur. Change of bat for De Villiers. End ofn the over, RCB are now 138-2 after 13 overs. Watson replaces Tahir: Wide and single taken so far. Smashed outside of off stump as de Kock takes a single. Double and a single as DE Kock gets back on strike. THree balls to go in Watson’s over. High and pure miss hit but lands safe! De Villiers gets lucky as he takes a single. 6 runs from this over so far can Watson change the flow for CSK? Good yorker by Watson as he gets another dot. Due is coming in, Watson can make things difficult with his variations. WHACKED! That’s some way to bring up your half century! De Kock is loving it here! 52 JUST off 32 balls for the South African. Brilliant hit to end the over, RCB arcruisingng, its 118 for 1 in 12 overs. Tahir replaces by Dwayne Bravo: OUT OF THE PARK! Brace yourself folks, AB has smashed that for another maximum. Set it up beautiful. Quick single as Dhoni has to sprint hard. Tahir has been smashed for 2 sixes in this over over. End of over RCB are now 106 for 1 in 11. Dhoni introduces Dwayne Bravo: Dhoni keeps changing things up to surprise RCB. Experienced Bravo starts with a yorker. Slower ball, Punched away for a maximum by de Kock. Bravo slipped his off cutter and de Kock smashes Bravo for a SIX!. Another yorker and dot by Bravo. Long for a while: Dwayne Bravo is the highest wicket take in T20 cricket. Good running between the two as they put up 50 run stand with that. Dhoni is still keen on moving fielders on every ball. Another tight single taken by as AB gets the strike. AB smashes it fine but will have to settle for a single in the end. End of the over, RCB are now 87 for 1 in 10 overs. Shane Watson replaced by Imran Tahir: Dot and single from the new bowler, who is familiar with AB and De Kock’s batting style. Back to back single by both batsman. de Kock aims for a boundary but will have to settle for a singel. Awkard bounce! But good recovery in the end as AB takes 2 more runs to end the over. 9 gone RCB are now 77-1. Shane Watson replaces Jadeja: Quick single was taken by de Kock and AB. Good length by Watson but de Kock is keen on perishing even the good balls as he gets FOUR!. Good recovery by Watson as de Kock is beaten away by pace in the next delivery. Cuts away the next one but will get a single in the end to put the dangerous AB back on strike. Sliced hard but will get a single. De Kock to face the last bowl. Slowe ball, single taken by AB as RCB reach 72-1 in 8 overs. Harbhajan Singh replaced by Jadeja: Strong appeal on the first ball, denied by the umpire. AB sweeps and clears the boundary! SIX! Phenomenal batting by AB. Glorious drive the Proteas talisman as he puts his compatriot back on strike. Pushing hard for two in the next ball and they will get two in the end. Just a single on the last ball as RCB reach 63-1 in 7 overs. Harbhajan Singh replaces Thakur: What a shot by AB! The South African talisman dispatched Harbhajan for a maximum. Inside out by AB! Flat six by De Villiers. He is taking the Harbhajan challenge with ease as he smashes him fo another. One again! This time on the on side, AB frees his arms and gets over point for another boundary. Backs away in the end , welcome dot ball for Harbhajan. End of the over, 17 from it as RCB reach 52-1 in 6 overs. Harbhajan Singh replaced by Thakur: OUT! Kohli departs as Thakur takes the mighty whale for Chennai Super Kings! Jadeja doesnt miss those and thats a huge wicket for Chennai Super Kings. Kohli goes for 18, RCB are now 35 for 1. Shardul Thakur removes dangerous Kohli as AB de Villiers takes over. Strong bottom hand by AB but we won’t be testing strong arms of Jadeja this time. Swing and a miss by de Villiers as Shardul mount back the pressure. That’s a wicket maidenn by Shardul Thakur. Excellent over by Shardul Thakur as he roadblocks the run rate. RCB are now 35-1 in 5 overs. Harbhajan Singh replaces Chahar: Dhoni has decided to take the pace off as he introduces the Turbanator. Harbhajan doesn’t like bowling in the powerplay if his glittering spells with the Mumbai Indians are concerned. So far so good for Bhajji as he has leaked only two runs in 4 balls. Down the track goes de Kock and takes the aerial route like a charm. Even Virat Liked it! 2ND SIX to him!. Dot on the last ball as Harbhajan goes for 7 in his first over. RCB are now 35-0 in 4 overs. Deepak Chahar replaces Thakur: Kohli takes a single on the first ball. Another dead ball by Chahar, sweaty palms we reckon. HIGH! BUT SAFE! Dhoni gets sprints superbly to save a boundary. Kocks takes two. Stand and deliver by Kock! SIX! First maximum by the South African batsman. After thrilling two balls, de Kock takes a single to put Kohli back on strike. FOUR! Kohli drives it perfection to get another boundary. A desperate attempt by Sam Billings but he was unable to stop this one. Kohli moves into 16 in just 10 deliveries. Single taken on the next ball as he gives de Kock the strike but he won’t get because its the end of the over. RCB are now 28-0 in 3 overs. Shardul Thakur replaces Deepak Chahar: Shardul starts with a dot as de Kock rechecks his stance. Late swing on the next ball as de Kock flicks it fine for a single. What a shot that this! Brilliant for Virat Kohli as he gets another boundary. Decent pace by Shardul but Kohli was quick to read it smash for four. Kohli gets the next ball through as well. Takes a quick two to overtake Suresh Reina as he becomes the highest run-getter in cricket’s biggest extravaganza. Kohli ends the second over with a single as he retains the strike. 2 overs gone, RCB are now 13-0 in 2 overs. Deepak Chahar to Quinton de Kock: First ball dot as Quinton drives the ball on the off side. Little bit of swing on the next ball for Chahar as de Kock drives to get off the mark. Virat Kohli on strike now. Strong bottom hand from the RCB captain, another dot for Deepak. FOUR! Put away by Virat Kohli. What a way to get off the mark. Kohli dispatched Deepak in some fashion as ball disappears for four. Fine leg comes up after that. Good line by Deepak as he bowls the next ball a dot. Dot again as Deepak ends his first over. RCB are 5 without loss in the first. 8:00 PM IST — In comes the umpires along with Team CSK as we are almost ready to play. Virat Kohli is also seen walking in as the skipper has come in to open the RCB innings with Quinton de Kock. Kohli gets a resounding welcome as we go the final countdown. 7:30 PM IST — MS Dhoni has won the toss and Chennai Super Kings will bowl first against hosts Royal Challengers Bangalore. Put in to bat by CSK, Bangalore are having a slight change in the opening lineup as skipper Virat Kohli will open the innings with Quinton de Kock. Let’s take a look at the squads of RCB and CSK on Matchday 24. Royal Challengers Bangalore: Quinton de Kock (w), Virat Kohli(c), AB de Villiers, Mandeep Singh, Corey Anderson, Colin de Grandhomme, Washington Sundar, Pawan Negi, Umesh Yadav, Mohammed Siraj, Yuzvendra Chahal. Chennai Super Kings: Shane Watson, Ambati Rayudu, Suresh Raina, Sam Billings, MS Dhoni(w/c), Dwayne Bravo, Ravindra Jadeja, Harbhajan Singh, Deepak Chahar, Shardul Thakur, Imran Tahir.